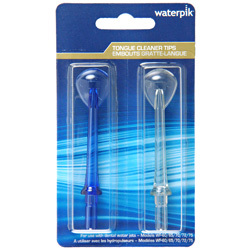 Waterpik Tongue Cleaner tips for WP-60W, WP-70W, WP-72W, WP-90W and SR-400W only. For fresh breath. With a gentle scraping and flushing action the Waterpik Tongue Cleaner removes bacteria and sulpher compounds that reside on the tongue and cause bad breath. Daily use can help prevent halitosis. For use with Waterpik Classic Water Flossers. Change every 6 months.